zhel, not far from the city of Moscow, has long been famous for its rich deposits of clays suitable for the making of pottery, and, hence, for the ceramic industries that grew up around them. In fact, practically the entire population of some thirty villages in this neighborhood have long engaged in the manufacture of pottery, the more so, as considering the dense sprawling forests around, there has never been any shortage of firewood. 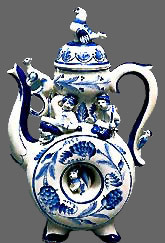 One could say that it was symbolical for Gzhel to be understood already in the 19th century as synonymical, to a great degree, with Russian folk ceramics. True, it was somewhat earlier, in the previous, 18th century, that Gzhel rose to fame as a large ceramics center that produced not only earthenware for purely utilitarian purposes, but also artistic and decorative objects. 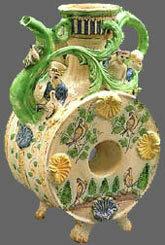 This development coincided with the emergence of majolica. 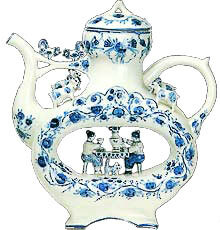 At the time majolica wares were called in Russia tsenina. The origin of the word is not known exactly. 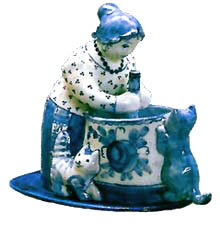 Majolica wares were termed in Europe faience. The product was usually made of tinted clays, had a massive porous shell, and was decorated with enamel colours in polychromatic, typically peasant-style designs. 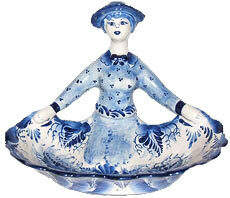 True, tsenina was first manufactured in Moscow at the establishment of the merchant Afanasy Grebenshchikov, who employed a number of potters from Gzhel. 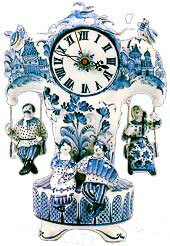 Returning home and having learned the secrets of majolica manufacture, they started their own potteries. 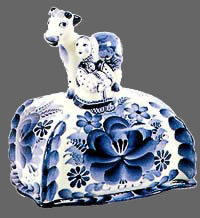 Though we have no idea who they were-their names have been lost - they made so fine a start that within the space of but several years, Gzhel majolica was already successfully competing with Grebenshchikov's produce. Whereas the celebrated Italian Renaissance majolica borrowed subject material from contemporary painting and served an exclusively decorative purpose (produced mostly were large vases, giant dishes and bas-reliefs), Gzhel ware was, on the contrary, of utilitarian shape and form and was decorated with the two-dimensional designs that are typically of folk origin; the large local pools of bright color displayed a marked affinity with the lubok, the Russian folk picture or broadside. The range of Gzhel majolica included virtually the entire assortment of domestic utensils, such as breakfast and soup plates, dinner-services, mugs, tankards, and pitchers. 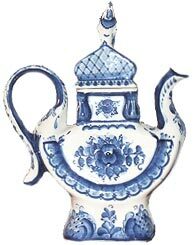 More often that was only white-glazed earthenware devoid of decoration; however it was prized precisely because of its hygienic whiteness. Yet, there has always been - and will always be - a popular demand for attractive, colourful, artistic objects. Every potter worthy of the name sought to create something individual, having some curious or amusing detail and a colourful design appealing to the customer. The subject material does not possess much in the way of thematic diversity, it was not borrowed from contemporary painting or literature, but was the invention of the potter himself, who though often illiterate, displayed artistic intuition, enabling him to integrate in his decorative designs his observations of nature and of rustic and urban life with impressions derived from buildings and icons seen, and to touch up the result with his own imagination. The design is a hand-painted drawing, outlined by some dark pigment on the light-toned glazed surface and then ornamented with green, yellow, brown and blue pigments. There is nothing particularly outstanding about Gzhel's scenic surroundings. Except, of course, the stretching fields, the blue fringe of forest in the distance, and the limpid bluish haze enveloping the small villages in its neighborhood. 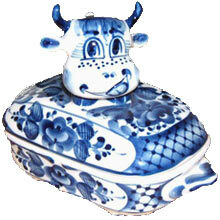 Perhaps it is this shimmering blue that has been transferred to the snow-white field of Gzhel's porcelain? Perhaps it is responsible for all the attractive designs we find on some slender vase, pot-bellied pitcher, or stalwart tankard generating that delightful feeling of surprise and joy upon spotting the first few clumps of spring flowers in the patches left by thawing snow? Truth to tell, skilful modeling and masterly brushwork have transformed what would appear to be plain ordinary household utensils into genuine works of art. 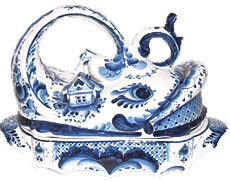 Gzhel porcelain enjoys extensive popularity both in this country and abroad, recognizable at once by its characteristic blue-and-white color scheme, peculiar designs, and shapes. The clue to this amazing success derives from the strikingly expressive uniqueness of Gzhel china, which provokes a stirring emotion of communion with Mother Nature. No wonder, as these hand-painted pictures most pleasingly harmonize with the shape. 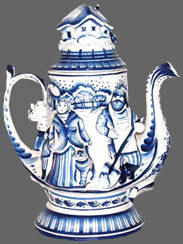 But the new Soviet government did not overlook the folk arts and craftss. While new economic and social foundations were laid to promote the folk arts and crafts, every care was taken at the same time to preserve their traditional principles. By the 1920s some of Gzhel's potteries were back on their feet again. 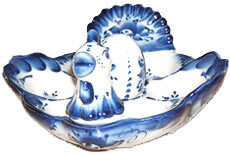 Cooperatives were organized, first among which was the Period, Keramika (Forward, Ceramics) started in 1929. After the growing pains of organization, the Gzhel industry acquired a firm economic footing, and was about to tackle the problem of producing highly artistic pieces when the Great Patriotic War intervened. Though work was suspended for a couple of years, by 1943 the potters were at work once more, now turning out, as Tatyana Yeryomina recalls, "One plain, common mug. Though it was hard and though we had to cut the firewood ourselves, keep the kilns burning, and produce quantity ware, nevertheless we tried to ornament the mugs as best we could." Attempts to revive the old traditions were initiated to wards the close of the war, with art historians, artists, and production engineers from the Arts and Crafts Research Institute, as well as local potters, joining in the effort. The large Gzhel collection at Moscow's State Museum o History, which earlier only a few specialists had know about, was brought to the notice of Gzhel's potters a designers. N.and V.Bidak "The small herdess"
(after the tale "Little Hundchbacked Horse"
"The woman shaking up the butter"